Like RIA Facebook page to get latest RIA Holi updates. Food and extra color can be purchased ONLY FOR CASH. Please do carry cash. 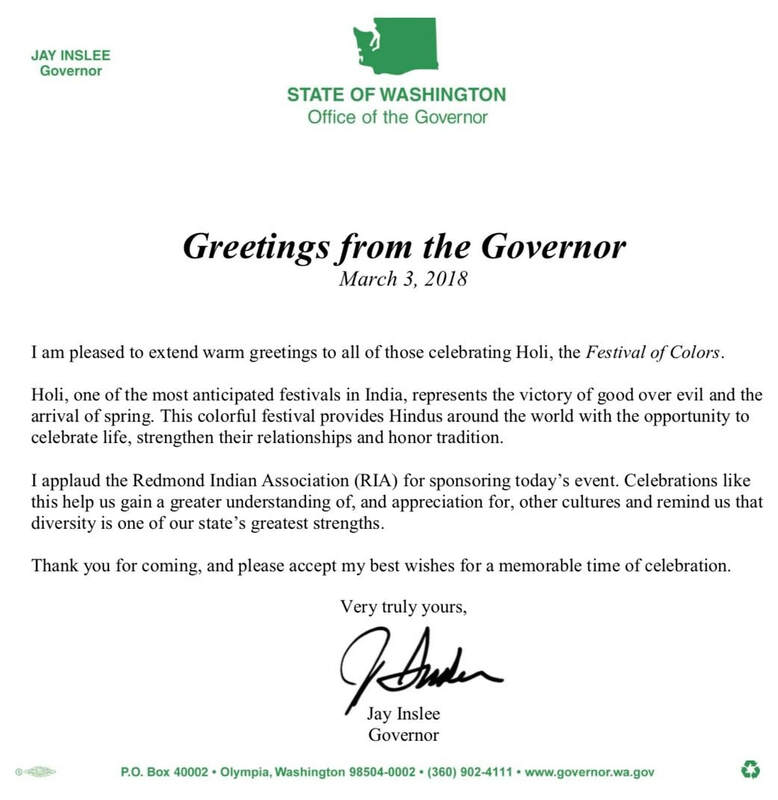 Redmond Indian Association (RIA) is excited to celebrate the festival of colors with you. While our team of volunteers are putting the final touches to make this a fun and memorable event for all of us, here are a few quick updates we need you to keep handy as you get ready for the event. Yes, you did read that right! Given the huge demand from the community, we are making additional tickets available at the gate. Yay! Free admission for kids aged below 4. Ticketing will start from 12.00 Noon. Do arrive on time to fully enjoy the fun-packed afternoon. As bonus this year, we have arranged for free colorful Holi hats for ticket holders and gifts for young kids. These freebies are available first come, first serve. Wristband: You will need to wear it for the entire duration of the event. Please keep the wristband displayed all times. In case you remove or lose the wristband, you may be asked to leave the venue. Color bag: You will be provided with one 200 grams color bag each for each ticket purchased. If you want to purchase more color bags, you can buy them for $5 each. NO OUTSIDE COLOR IS ALLOWED. In line with our mission, RIA continues to strive to create better civic and political engagement, in our own lil ways. This has served the community well by creating awareness about our amazing diverse community at the ridge and especially helped us in getting support for the issues faced by us like the proposal to establish huge Marijuana production and processing right in the smack of our community. 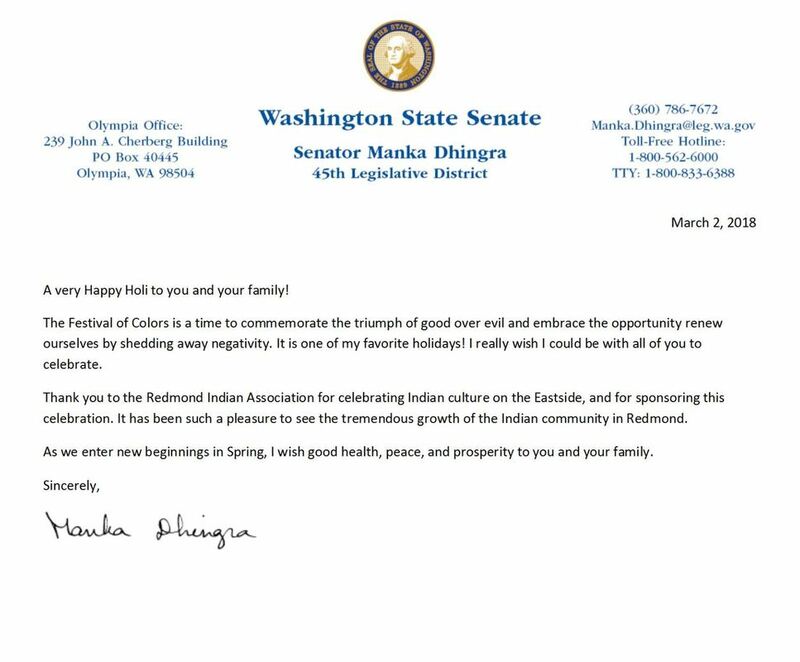 ​We thank Governor Jay Inslee, Congresswoman Suzan DelBene and State Senator Manka Dhingra for extending Holi greetings to the community. We have also invited 5 teachers each from all the area schools (Rosa Parks, Wilder, Emily Dickinson, Explorer and Evergreen Middle). Along with the teachers, we have also invited the brave firefighters who serve Redmond Ridge. Please welcome all these folks and help them have fun and experience our culture. ​Our DJ will be doing a count down for the color throw. To fully enjoy the color throw, please assemble in front of the picnic shelter and be ready with your color bags to kick-off a color storm. Group color throw is simply AWESOME and we bet you will have lot of fun. Our volunteers are eager to help you at the venue. For any questions, concerns or help, reach out with a smile:) to your nearest RIA volunteer. Do NOT bring any color, food, narcotic substances, alcoholic beverages, water balloons, water gun and fireworks. Smoking is not permitted at the festival park. Play with colors only in the designated playing area. Keep the venue clean and avoid littering. Remember its our park, where our kids play. Do not throw colors into people’s eyes. Courtesy plastic bags for a change of clothes etc., will be available at the venue. You could wear this on top of your clothes while driving back from the event. Please be courteous in the neighborhood. Allow space for residents to park in front of their homes and do not block driveways. If a resident asks you to move, please do so. There will be a few parking spots reserved for the vendor and volunteers. Do not take those spots. Exercise politeness at all times. The color supplied may stain hair & clothes, so do not wear your “Saturday best.” To avoid and/or minimize stain, dust off all dry excess powder before stepping into a shower, or throwing your clothes in the wash. Once the caked dry colors get wet, it is hard to get out. However, if one can shake as much as possible out while dry, there is a good chance of not having undesirable color in the hair. Do not wear contacts to the event! Do not throw colors on any passing cars, folks not participating in the festival. Be courteous of local businesses and do not leave messes in their bathrooms or the honey bucket near the park. Do abide by all the rules of the Redmond Indian Association, Redmond Ridge East HOA, and applicable federal, state and local laws. Any violation of these rules and guidelines and laws by the undersigned is cause for immediate expulsion from the venue..